Mull (Scottish Gaelic: Muile, pronounced [ˈmulʲə]) is the second largest island of the Inner Hebrides (after Skye). It lies off the west coast of Scotland in the council area of Argyll and Bute. It has an area of 875.35 square kilometres (337.97 sq mi). Mull is the fourth largest Scottish island and the fourth largest island surrounding Great Britain (excluding Ireland). In the 2011 census the usual population of Mull was 2,800. In the summer there are also many tourists. 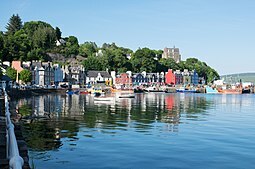 Much of the population lives in Tobermory, the only burgh on the island until 1973, and its capital. Tobermory is also home to Mull's only single malt Scotch whisky distillery: Tobermory distillery (formerly Ledaig). ↑ Tobermory Distillery tobermory.co.uk Archived 15 May 2011 at the Wayback Machine Retrieved 2010-07-10. This page was last changed on 6 August 2018, at 14:21.